I tried garlic knots at many places and wanted to make them on my own. 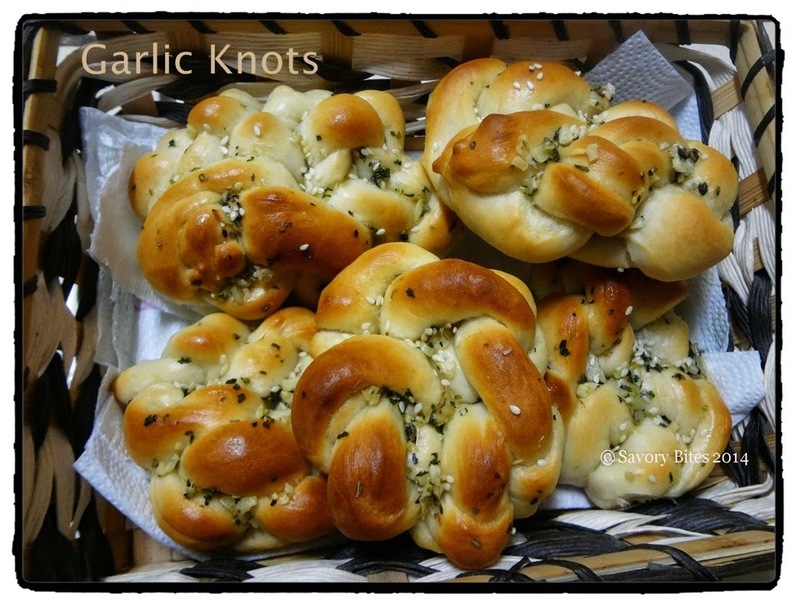 Garlic knots is good to eat anytime of the day :) It works fine with any curry or just dip them in tea or coffee!! This is something you can prepare even when u need to fix dinner in a hurry. Its pretty simple to make and lovely to eat. Try it out and let me know how it works for you all!! Mix water, sugar and yeast and let it sit for 5 minutes. Add flour and salt to the water, sugar, and yeast mixture. Mix this and let it raise for 10 minutes. You can try this with hand mixer...this step is pretty quick. Roll out the dough on a plane surface and cut the dough in half and then in strips for the garlic knots. Roll the strips and then tie in knots. Now bake the knots at 400 degrees for about 15-20 minutes. Melt the butter and mix with garlic, parsley, chilly flakes and olive oil. When the garlic knots are done, brush them with the garlic mixture. Garnish with the sesame seeds. If the quantity of water is not sufficient for the dough to be smooth you can add 1 tbsp of oil to it.